You can customize panel layouts in TextTransformer and create custom docking schemes. This feature is especially convenient for smaller display resolutions, since it allows you to display several panels simultaneously. 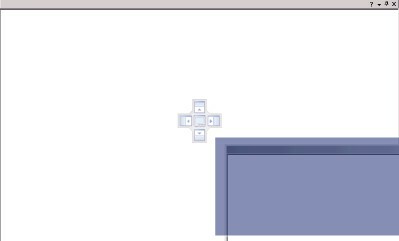 While pressing the left mouse button you can drag the line to the new position, where it remains, if you let off the button. 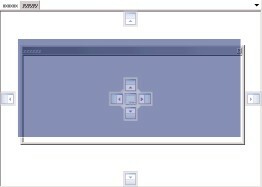 To dock a panel to the left, top, right or bottom edge of the the lower panel, move the mouse cursor to the , , or icon within the Selector and then release the mouse button. Once a floating panel has been docked onto another panel, it still has a caption bar, with a name at the left and buttons at the right, and the previous contents likewise have a caption bar on top of their section of the page. Any section can again be turned into a floating window by dragging the caption. If you select the icon in the docking zone selector, the floating panel and the lower panel will be docked at the same spot. In this case, the panels will be organized as tabbed pages (tabbed panels are simply panels docked not inside one another, but at the same spot). You can dock more than two panels to the same spot. To undock a tabbed panel, just drag or double-click its caption. Note that when you are dragging a float panel over a tabbed one, besides the docking zone selector in the center of the tabbed panel Automated Build Studio will also show docking zone selectors along the edges of the tabbed page. These selectors let you dock the floating panel relative to the whole tabbed spot. 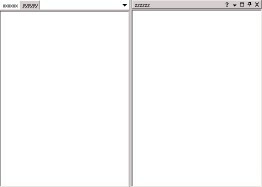 Using the central selector you will dock the floating panel to the the tabbed panel that is currently in front of the other tabbed pages. If you select this variant, then the tabbed page will hold two panels. To hide a panel, click the button in the panel’s caption. To view an auto-hidden panel, move the mouse cursor to the panel caption or click the caption and the panel will pop up. To show a hidden panel, simply click the button in the panel caption. Rename Calls the Panel Caption dialog where you can rename the tab. 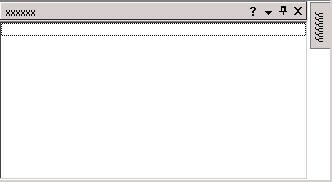 Help The Help item is displayed if the tabbed page contains one panel only. It calls the help topic with the panel description. If the tabbed page holds several panels, the Help item is hidden.